Do you need a smart tool that can manage source control, work items and company policies, as well as enable collaboration across disparate teams for your mainframe multi-platform development environment? Rational Team Concert for System z is the right choice for you. IBM Rational Team Concert provides the foundation for developers to manage enterprise-wide software changes and collaboration. RTCz provides a single solution for source control, build management, release management and project planning. It also offers dashboards for project managers to efficiently control the project. 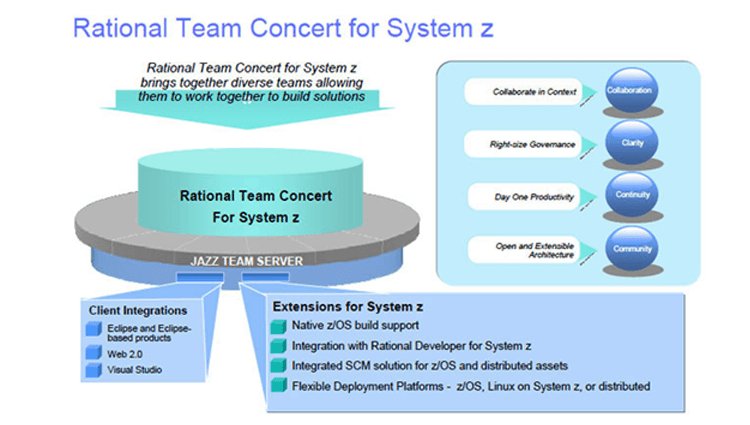 Rational Team Concert for System z helps project managers divide the project into multiple work items and activities to manage teams more effectively. RTCz also provides advanced build capabilities with dependency management, build impact analysis and promotion support for z/OS.